The last time I made risotto, I caught my 4 year old trying to give the cat a haircut. This is what happens when you decide to make risotto at 5 o’clock on a weeknight. You become a slave to the stove, frantically stirring away while your kids try to pull a fast one on you (the cat survived). What was I thinking?! Gone are the days my friends. No stirring, no babysitting. Your oven does all of the work. All you need is a Dutch oven and a couple of basic ingredients to get started. I flavor my risotto with leeks, however a small onion or maybe some shallots would work as well. Give them a quick sauté, and then add your aborio rice. Cover with liquid and bake for 45 minutes. Because of the natural starches, there is no need to douse it in extra butter and cream. The result is a rich and oozy risotto rival to any restaurant. 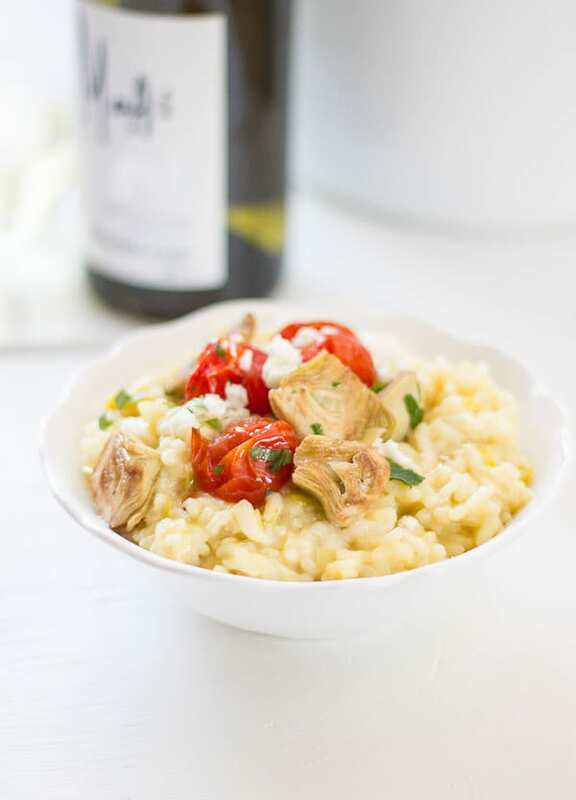 While your risotto is in the oven, use that time to whip up a quick topping if you want. I used the leftovers from our Superbowl antipasti platter (yes, that’s how we roll) to make the first dish. For the second version, I combined bits and pieces of leftover roast chicken with sautéed mushrooms. Then I threw it all together in one pot just because I was curious… it was so good! 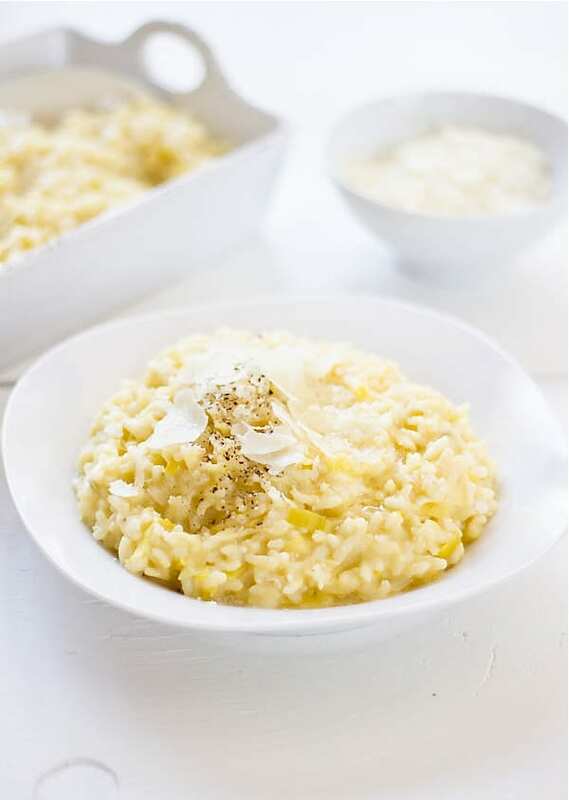 One last thing- when your risotto comes out of the oven it will be quite liquid, which is how it’s supposed to be. 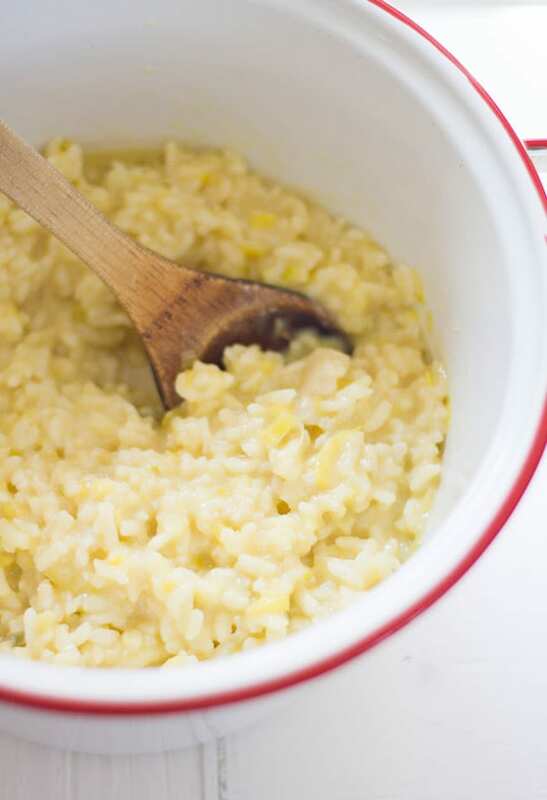 If you prefer a bit thicker, just let it sit so that the rice can absorb additional moisture. You can easily correct the texture with more or less liquid according to your liking. Dust with parmesan cheese and you’ve got yourself a feast! In a large Dutch oven, warm the olive oil over low heat. Add the sliced leeks and saute until soft, but not colored about 5-10 minutes. If the leeks start to catch on the bottom of the pot, lower your heat and add a splash of water to loosen. Pour in the wine and cook until the liquid has evaporated. Add 4½ cups of chicken stock. Cover and place into the oven on the center rack. Bake for 45 minutes. 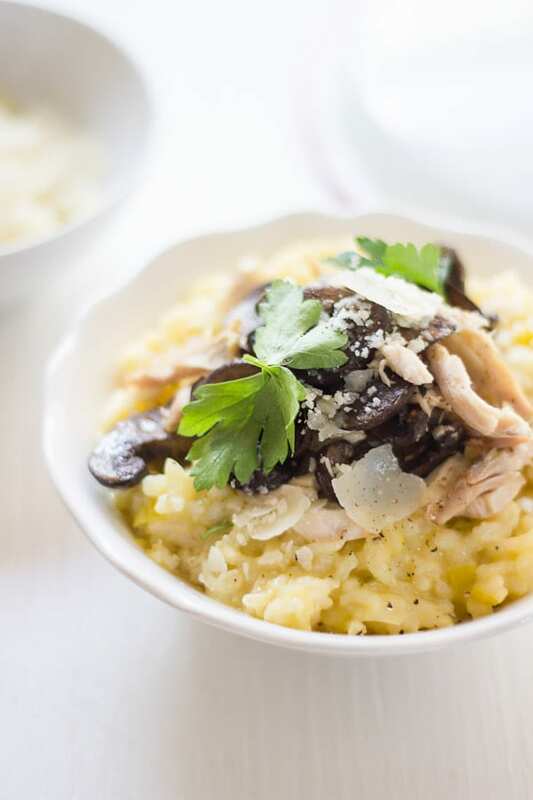 Remove the risotto from the oven. Add the remaining ½ cup of chicken stock, parmesan cheese, and butter and stir frequently for about 1-2 minutes. The texture should be oozy, not stiff. Add extra stock if necessary. I adore you for this recipe.. Thank you! Those toppings are to die for. I cannot wait to try this one! Yes please to baked risotto, this is gorgeous! I did not know that risotto could be made via oven..how awesome! Love all your toppings…delicious! Glad your cat was ok…hahaha…I can relate all too well. The same reason why everything I own is broken or slightly broken. I’m hoping that when they are teenagers our life will get a little easier, while we listen to the mother’s with daughters complain..hee hee! 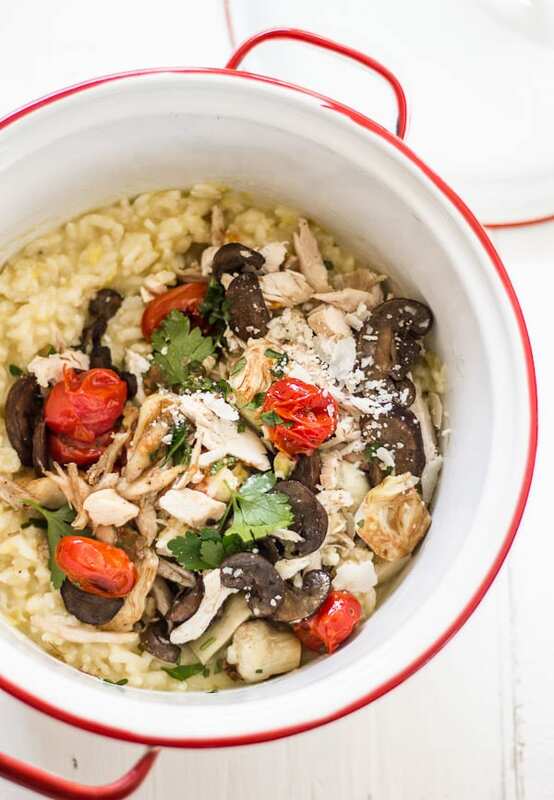 Chances are when we go out to eat and risotto is on the menu I go for it. Because I never want to take the time to stir and stir at home! Now I can make my own delicious risotto without the hassle. What a great help! I discovered this way of cooking risotto by chance because I can’t get a low flame on the gas hob. And now I never cook it any other way. I’m sure there are risotto purists who would turn their nose up but I bet if you served it up to them they wouldn’t know the difference. Gorgeous photos too. Wow! Thanks so much for this recipe. I LOVE risotto, but have a two year old and am six months pregnant with our second, so my cooking as of late has been, uh, lacking. This sounds perfect! Hi Michelle! Thank you so much :) This recipe is perfect for busy families, especially when dinner ideas are hard to come up with (I totally get it…) It’s easy and stress free. I hope you enjoy! Made this tonight and it was fantastic! I have to admit I was preparing myself to find rice stuck or burnt on the bottom, but everything was perfectly moist and creamy… so good. Everyone liked it a lot. Your risotto is the most incredible risotto I have ever seen! Like seriously wow!! That’s got to be a lifesaver with small children, Emilie! Looks delicious too, and not at all boring! :) I love how gorgeous your pics are – just saw your snow covered outdoor table, so I KNOW it must be very overcast, but the light in your last photo is absolutely stunning! I’m with you on the baked risotto. I’ve made it in this fashion for some time now, and ti really is a no hassle method. And, as always, your photographs are really beautiful. Brava! Would the oven time change much if I doubled the recipe? I’d like to make this for Easter. Hi there! I’m not sure to be honest, because I haven’t tested this myself. Perhaps, if you have the time, make a test batch before Easter? That’s what I would do just to make sure! I made this last night with onion and Parmesan Reggiano cheese. The topping was Navy beans with ham. 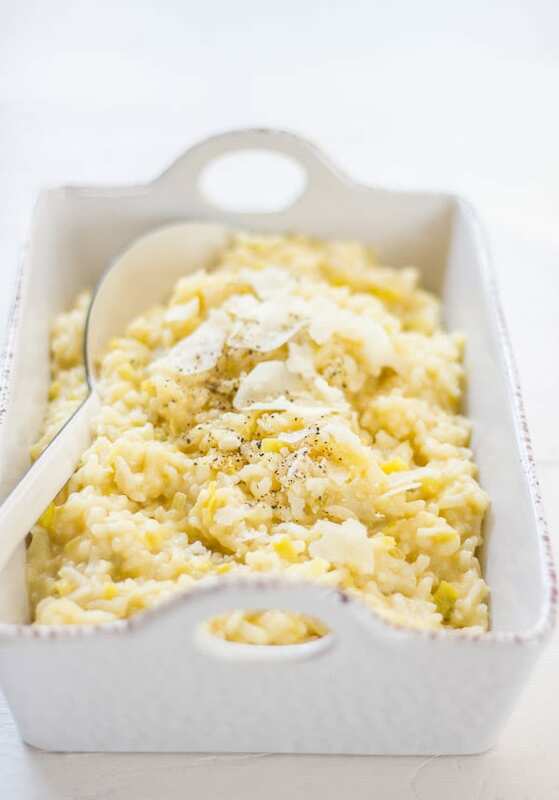 You can put anything with this Risotto and it will taste heavenly. The liquid amount makes sense here, I guess there is a mistake in your book about the stock quantity (1,2 l stock for 950 g rice)?